Whenever we’re out on the field, hiking a storm up, coming back to our tents and having a warm meal ready for us is seldom one of the thoughts that cross our minds. The truth about hiking is that, more often than not, carrying ready-to-use supplies — as opposed to foodstuffs and goods which require cooking or preparation — will most likely be the go-to choice for campers and hikers. This is because having to adapt your campfire to use a grill can be challenging or outright dangerous if you don’t know what you’re doing. Furthermore, lugging a big grill around in your pack can slow your pace down or even cause injuries in the long run. However, this doesn’t mean that enjoying a good expedition during the day and coming back to warm meal in the evening is impossible. Nowadays, there are portable stoves available in the market which are lightweight, effective, and can be easily folded up and carried in your bag so you can settle down anywhere and enjoy a great meal out in the wilds. However, as is the case with most products in the market, there are a wide variety of portable stoves available for purchase which come in different types, shapes, sizes, and with different energy sources. With so many types of stoves in the market, choosing the right one for your needs can be a challenging endeavor, especially if you’re more of a casual camper and don’t know exactly what you’re looking for. If this is your case, then this article is for you. We took the liberty of testing several portable stoves and compiled a list of the best 10 products in this category so you won’t have to waste time and money looking for the perfect backpacking stove. The products in this article were chosen, first and foremost, for their performance, while also taking into consideration the type of situation they’re designed for as well as the price tag. Whether you’re someone who enjoys any type of food, or a connoisseur of fine dining, on this list you will find a product suited to your needs. However, before we hop into our top 10’s, it’s important that you know exactly what to look for when browsing the market for a good portable stove. In that sense, we have gathered a list of features and specs which can make a product in this category stand out among the rest and compiled this into this handy buyers guide. With the information provided in this article so far, you are now able to select the very best wood burning stove to satisfy your camping needs. However, if you’re not sure where to start, we’ve compiled a list of the very best wood stoves we’ve had the privilege of testing. 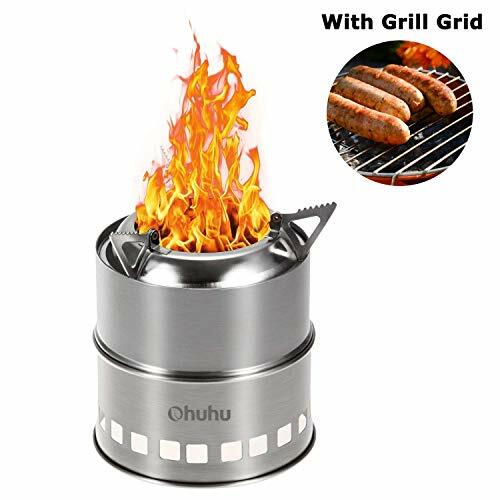 The products featured on the following list will offer you the very best performance for their price and will provide the best cooking experience in the great outdoors. We’re starting this list strong by offering you one of the top sellers in wood burning stoves. 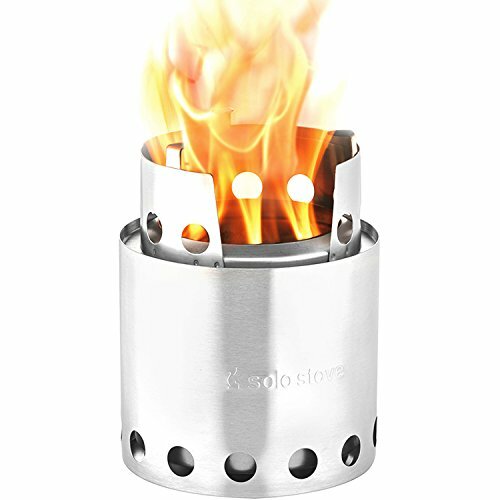 The Solo Stove Lite wood burning stove is designed and manufactured by Solo Stove which, as we mentioned above, is one of the best brands of products for the great outdoors in the market. The brand alone should help set the tone for the quality of the product itself, but since we can’t go on names alone, let’s talk a bit more about what makes this product so great. For starters, this stove comes equipped with a double wall which helps to intensify and concentrate the heat produced by the burning directly onto the pot above, which means that this stove can easily operate in extremely low temperatures. The stove’s patented design also allows it to produce a near smoke-free flame, increasing, in turn, the fuel’s efficiency. This stove is small and made out of stainless steel, which makes it both sturdy and compact. Its cylindrical shape has a 4.25-inch diameter and is only 5.7 inches tall. When disassembled, the stove’s height is reduced to 3.8 inches for easy storage. This is also one alternative you might want to keep in mind if you’re looking for the best value in a wood burning stove. While the WoodFlame is not as portable or lightweight as the other products on this list, its functionality more than makes up for it’s bulkiness. Furthermore, its weighty build will hardly be an issue for weekend campers who are going to be lugging their gear in the back of a truck or the trunk of a car anyway. The most important selling point of this stove is its design, which, thanks to several strategically placed air vents, allows just the right amount of air to circulate and keep the flames alive and burning hot and bright. Thanks to this design choice, your flame will provide a constant heat and will reduce the time necessary to cook any dish or boil water on the stove. and will provide you faithful service for years to come. If that wasn’t enough, and you’re still not sure of the stove’s quality, you can still give it a try and return it if you’re not satisfied. The seller provides a satisfaction guarantee, which means that you can easily return it for any reason, including deficient service or even for something as simple as not being completely happy with your product. The Ohuhu Portable Wood Burning Stove is the go-to choice for hikers and campers on a strict budget. The low price tag coupled with a very small frame makes this stove one heck of a deal. Don’t let this stove’s small size deceive you though; this portable wood burning stove burns really hot and is able to boil a liter of water in just under 4 minutes and 30 seconds. The small frame of this portable stove is littered with lots of small air vents so that the air only circulates towards where it’s needed most, ensuring your flame burn at a very hot and constant rate as long as the fuel lasts. The tradeoff, however, is that this stove doesn’t have a slot or opening in which to resupply the fuel compartment. Instead, in order to keep the fire going for longer, you’ll need to supply it with small, pencil-sized sticks and twigs through one of the air vents. This can come off as an inconvenience for some, but keep in mind that the lack of any big openings is part of the stove’s design is in order to keep the fire steady even in moist or windy conditions. When you also consider the fact that this stove performs much better when using smaller pieces of wood, then the lack of any opening suddenly doesn’t seem so bad. That being said, this stove is perfect for long hiking trips, as it weighs just a few ounces and can fit neatly into any camping bag. Although the stove can’t be folded due to its round circular design, it can be disassembled into several small pieces and easily stored inside its mesh bag for easy transportation. The portable wood burning stove by Lixada shines for its versatility due to its ability to operate using different types of fuel. Although it is a wood burning stove, in essence, this product can easily operate using liquid and solid fuels such as white gas, or solidified alcohol. 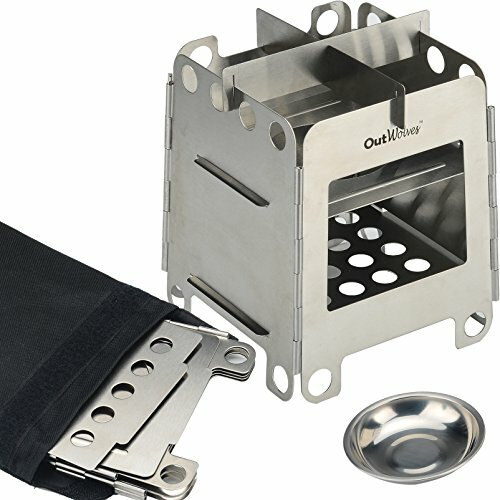 Like the Ohuhu stove mentioned above, this product also features a similar design using mostly small air vents which ensure a strong and steady flame. 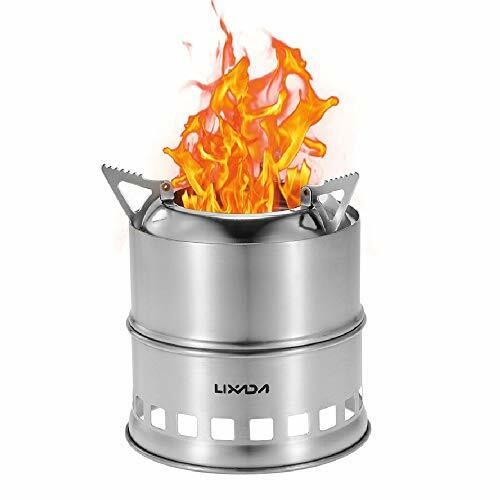 In this sense, the Lixada portable wood burning stove is also very small and lightweight, perfect for those hiking trips where you need to keep your bag light. This wood stove weighs just over 13 ounces and can be disassembled into several parts for ease of transportation. Included with the purchase of this product is your very own mesh bag for storage of the stove. However, we recommend that you immediately purchase another type of bag to transport this stove, as its sharp edges will most likely damage and cut through the mesh, rendering the bag unusable. For its small size, this stove is also very durable, as it is made from stainless steel. This means, however, that it’s also somewhat heavier than stoves made out of titanium. Regardless, the stove’s size is so small that the difference would be hardly noticeable anyway. This just may be the most high-tech stove on this list, which makes it an ideal entry to end it with. The BioLite Wood Burning CampStove is, by far, the most expensive entry on the list, which may put off some buyers who are only looking for the most basic features. However, with the purchase of this stove, you will not only receive a basic wood burning stove, you will also receive the quality and proprietary technology developed by the team at BioLite. this stove you’ll not only enjoy tasty meals, you will also keep all your appliances charged and ready for use, which is awesome for when you’re hiking far away from any power source. These features come with a tradeoff in the form of additional weight. The stoves built-in charger makes it weigh a total of 2 pounds which, if not every heavy (it weighs about the same a 1-liter water bottle), you will definitely feel it when you carry it in your bag. Still, the performance offered by this stove, coupled with the device charger more than make up for both the weight and price of the product. Despite being a great indicator of the quality of any given product, brand quality can only take you so far when browsing the market for the very best products in any category. No, if you want to make the best purchase to receive the most value for your money, you’ll need to know what to look for in each product and choose only the ones which satisfy all your requirements for the lowest price. When it comes to backpacking wood stoves, choosing a good product is actually quite simple since there’s actually not much to consider. Nevertheless, if you know what you’re looking for, you’ll not only have an easier time spotting a good product, but you’ll also save plenty of money in the long run by purchasing exactly what you need and nothing more. The material the stove is made from is an important factor to consider and will play an important in the weight and ruggedness of the product. Most wood burning stoves come in either stainless steel or titanium, the former being a bit heavier and sturdier, while the latter is light and easy to carry around. The mesh in these products is often made with either steel or nichrome. The size of the wood stove in question will vary depending on its form factor and are defined by the circumference of its base and its height. For pyramid or rectangular shaped camping stoves, the length and width of the base will typically vary from 3.5 to 5.5 inches to 3.5 to inches, respectively. Cylindrical stoves vary a bit in terms of dimensions, as the diameter of their base can go from 4.25 to 5.1 inches, approximately. Furthermore, the height of any given stove can vary from 4.5 inches to as tall as 8 inches. As you can see, wood stoves are typically quite compact, even when considering the size of their biggest models. Why go to such lengths to elaborate on the dimensions of these products? Well, because the size of the stove itself will determine the size of the wood they will be able to use as fuel. Evidently, bigger stoves will allow fitting bigger pieces of wood, saving you the hassle of having the chop them down to size. Some wood stoves come also in foldable styles, which makes storing and carrying them when not in use a completely trivial task. When folded, the thickness of these stoves rarely surpasses 0.25 inches for rectangular and pyramid stoves. Circular stoves can’t be folded since they’re not made out of independent plates. They can, however, be easily disassembled for easy storage. In this manner, they won’t take up much space in your pack. Casual hikers and campers may not care much for the weight of the stove as they don’t actually weigh that much to begin with, and they will usually be transported in an SUV or other vehicles. However, as most experienced campers and hikers can attest to, the weight of your gear can play a vital role in the success of your camping trip, as each and every pound will add to your pack, weighing you down in the process. Luckily, most wood stoves are actually pretty lightweight; some can weigh around 9 ounces, while the bigger stoves may weigh around 16 ounces. The heaviest stove in our list is, by far, the BioLite Wood Burning Campstove, which weighs 34 ounces due to the charging unit built into the stove itself. Regardless, wood burning stoves are among the most efficient in terms of size and weight, considering that you won’t have to carry the fuel with you since wood can be procured basically anywhere. The accessories included with your wood stove can usually make or break the deal for you due to the added commodities they can provide. For instance, most wood burning stoves come with their own mesh bag for easier transportation. Similarly, most wood stoves are compatible with other types of fuels, in case appropriate types of wood are hard to come by where you’re camping. Some stoves also feature electric starters to ease the process of igniting the wood which, in these cases, makes wood a mandatory resource. Keep an eye out for the stoves that come bundled with pots and pans, as these can save you a pretty penny and will serve you faithfully on most occasions. As we mentioned above, there are many different types of backpacking stoves, which can lead to confusion when trying to purchase the best product for your needs. The most common types of stoves are canister stoves, liquid fuel stoves, solid fuel stoves, alcohol stoves, and wood stoves. In this article, we’ll be focusing on backpacking wood stoves, since we believe these are the easiest to set up and use, and can effectively cook a variety of meals, as opposed to other stove types which are most effective for boiling and simmering. These are, by far, one of the most popular choices for hikers who want to spend the day traversing the wilds without their packs getting too heavy, and also enjoy partaking of warm meals in the evenings. Wood stoves behave very similar to cooking over a campfire, with the main difference being that the stove’s shape is designed to capture and channel heat more efficiently than what you’d get cooking over an open fire. The pros of using wood stoves are that you won’t need to carry fuel in your pack, reducing the risk of fire hazards and that you’ll also be using a renewable source of energy to power your stove. Furthermore, if you’re hiking, odds are that you will be able to find wood nearby, which means that you won’t be running out of fuel for your stove anytime soon. Wood stoves come with a significant downside, which usually stems from the tricky learning curve. Like starting a fire in a charcoal BBQ, wooden stoves require more practice and effort than their gas and fuel counterparts, mainly because you’ll need to learn how to ignite the wood just right to get a strong, uniform flame. This learning curve means that it’ll take more time to get your stove up and running, which can definitely be a hassle after a long, tiring day of backpacking. Furthermore, if it’s rainy out, or has been raining during the day, good fuel can be difficult to come by. The same goes for when you’re camping above the treeline. Luckily, most wood stoves can also be used with alternative fuels such as Esbit. Another thing you’ll have to consider is that wood stoves can and will blacken the bottom of your cooking pot with soot, so you will need a good carrying case for your pot to avoid getting soot all over your gear. Lastly, wood stoves can’t be used in zones where there are fire bans due to the potential fire hazard it poses. Despite the learning curve and other cons, wood stoves are, by far, one of the best options when it comes to cooking a wide variety of meals. The smoked flavor they add to the food — meat, in particular —— is a welcome addition to any dish. If you’re willing to put in the extra effort, then wood is the way to go. These stoves are some of the most simple models on the market. They consist of a lightweight stand upon which your pot will rest. Below it goes the Esbit fuel tab which, when ignited, will produce a medium flame for about 12 minutes. The convenience of using a pre-packed, easily ignitable fuel source makes these stoves perfect for use in a pinch, and their silent burning action won’t interrupt any sleepers as you cook breakfast early in the morning. However, this is where the pros of solid fuel stoves end, as they have several cons to balance out their efficiency. For starters, the fuel used by these stoves is not common in small towns, which can make it difficult for use by thru-hikers. Furthermore, this very same fuel emits a strong odor when burning and leaves a sticky substance on the bottom of your pot. The medium flame emitted by this fuel translates into long cooking times, and makes it very susceptible to wind, so a windscreen is critical for the proper operation of these stoves. Lastly, the most common fuel for these stoves (Esbit) is more expensive than other stoves’ fuel source, which can make them budget-heavy in the long run. Alcohol stoves were very common in the past, as their very small frames and easy to use presentation made them the stove of choice for most short hiking trips. However, they have all but been replaced by canister stoves as isobutane canisters are more efficient and are just as easy to find as Heet, the alcohol stove’s most common fuel source. 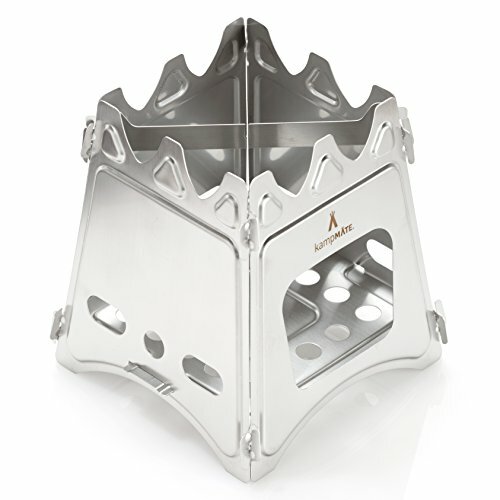 Nowadays, alcohol stoves are good as backup stoves since they weigh virtually nothing, and can be used in a pinch to generate a small and reliable fire. However, these stoves do not work in heavy winds, and their small flames usually translate into longer cooking times. There are some types of alcohol stoves which come in shapes that optimize their flame’s efficiency; but, even still, they require more patience to use than other stoves. One thing to keep in mind when using these stoves is that their flame burns a pale blue, which can make them hard to spot against a bright backdrop. You need to be very careful when handling them and make sure the flame has been completely extinguished before refueling or storing them in your pack. Furthermore, a drop of spilled alcohol can easily ignite dry brush, so the risk of fire hazard is high with these stoves, especially if you don’t know how to handle them. The weight and bulkiness of these stoves have made them harder to come by these days. With the invention of canister stoves, their liquid fuel counterparts have all but gone extinct. However, these stoves have their own merits which make them ideal for certain situations. As their name implies, liquid fuel stoves used liquefied substances to generate their flames, the most common of which is white gas. What these stoves lack in portability, they make up in versatility as these stoves can also operate with different types of fuel — such as unleaded auto fuel or kerosene — in case white gas is not available. Liquid fuel stoves are ideal for camping trips to frigid locations, where melting snow to obtain drinking water is paramount to the campers’ survival. These stoves can easily operate in extremely low temperatures and are often suited for camping trips where you’ll have to cook for lots of people. The stove’s stable base and cost effective fuel allow you to cook big meals using large pots without breaking the bank. That being said, their weight often outclasses the benefits these stoves provide, which makes them ideal only for a few situations. Furthermore, they require much more maintenance than other stoves and can be quite noisy during operation. However, if you’re looking for a reliable stove for your weekend camping trip with the extended family, and you have an SUV with plenty of space, then this type of stove just might be your best bet. These is one of the most reliable type of stove for 3-season camping and is the popular choice for many hikers and backpackers that regularly take to the field. Canister stoves require no priming, preheating, or any type of preparation to start cooking. Cooking with a canister stove is as easy as screwing the stove to the canister and turning it on. 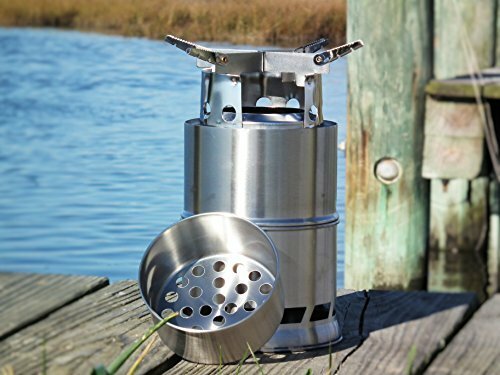 Canister stoves are also one of the best choices for campers who are looking to enjoy the flavor of a cooked meal with the convenience of having one of the lightest types of stoves in the market. For reference, a small 100g isobutane canister weighs only about 3 ounces, which is nothing compared to other camping gear. 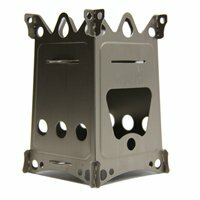 The only downsides of using canister stoves are that the fuel is a bit more expensive than the ones used by other stoves, and that while it’s easy to find the right canister for your stove in the local hardware store, you might have trouble finding it when camping in international locations. Canister stoves are those that absolutely must use the right canister for the stove, otherwise, it won’t fit and you won’t be able to use the product, hence the importance of having access to the right type of canister in any location. Furthermore, canister stoves are not effective when used in extremely low temperatures, such as below 20F. As packed as the wood stove market is nowadays, there are a few manufacturers that stand out among the rest for the quality, durability, and performance of their products. Sure, picking the right product for your needs can admittedly be a challenging task if you don’t know what to look for. Regardless, if you decide to invest on any of the following brands, you can bet that you’ll receive a quality product which will provide you years of faithful service. 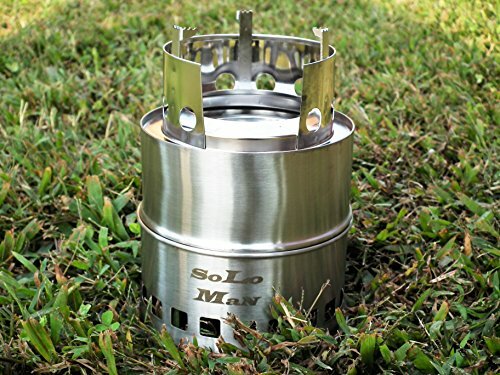 Solo Stove is a leading manufacturer of eco-friendly camping stoves. This company is wholly committed to the research and development of the best and most efficient backpacking stoves in the market. Through their patented wood-burning technology, this company is the leading authority in wood stoves and, with their proprietary secondary combustion design, their stoves create a clean, near-smokeless flame, minimizing pollution and keeping your pots soot-free. This prestigious company has been featured in several major news outlets such as The Huffington Post, Backpacker, Gear Junkie, Outside, Survivalist, and 50 Campfires. As a manufacturer of wood stoves, Kamp Mate actually has a very limited selection of these products. In fact, their catalog is limited to just one wood stove. However, the sheer quality of craftsmanship, coupled with a sturdy frame and a clean and uniform flame has earned this company a place on this list. Other than the one wood stove, KampMATE also manufactures and sells camping supplies and accessories such as windscreens, military shovels, headlamps, and pre-packaged camping food in various sizes. Ohuhu is not a manufacturer, but a reseller of a wide variety of high-quality products for multiple purposes. Their catalog varies from markers and color pencils, license plate frames, and 3D padded bicycle cycling underwear, to sleeping bags, blankets, protective gear, monoculars, and wood stoves, among many others. Thought this company is not solely focused on backpacking stoves, their quality assurance team always makes sure that you’ll be receiving the best products in their respective fields. That being said, you can rest assured that, if you invest in Ohuhu, you’ll receive the best products at the lowest possible price. Like Ohuhu above, Lixada is also a reseller of high-quality products. The main difference with this company is that they’re mostly focused on indoor, outdoor, and professional lighting solutions, as well as products for sports and outdoors. In Lixada’s repertoire, you’ll find everything from bicycling goods, products for game hunting, fishing gear, and camping & travel products such as backpacking stoves and trunk bags. The selling point that this company has over the competition is that their products are often inexpensive and still manage to offer great performance, providing you with great value for the price. BioLite is a camping and outdoors company specialized in manufacturing and selling off-grid power and cooking products to — in their words — transform the way we cook, charge and light our lives off the grid. This company is comprised of a team of engineers, designers, operators, and analysts who employ sustainable business practices to improve the ways hikers and campers enjoy their hobby of traversing the great outdoors. Founded in 2008, this company began their foray into the camping stove market with their prototype efficient wood burning stove which harnessed the power of thermoelectrics to create a smokeless fire, while using that same thermal energy to charge all manner of personal devices such as phones, tablets, and laptops, among others. This product has since been dubbed the BioLite Wood Burning Campstove and has gone on to act as the company’s flagship product. Several years and improvements later, BioLite is one of the biggest contenders in the race to create the cleanest, most eco-friendly wood burning stove in the market. That’s it for our list of best wood burning stoves. With the information contained in this buying guide you should now be able to browse for products in this category and make the very best purchase suited to your needs. However, if you’re still not sure which product to purchase, feel free to peruse the backpacking stove reviews in this article and choose from any of the products featured within. We assure you that you’ll be receiving the best performance at the lowest possible price.